Plenty of local, Irish—and local Irish—flavor is only display for Friday’s show at Liacouras Center in Philadelphia, Pennsylvania. The main event pits local southpaw Tevin Farmer (28-4-1, 6KOs) defending his 130-pound title versus Ireland’s Jono Carroll (16-0-1, 3KOs). The bout—which will stream live on DAZN—marks the first time in 16 years that a Philly-bred boxer defends a major title in the City of Brotherly Love. There wasn’t any greater representation on the show, however, then the all-Philly pairing between lightweight prospect Avery Sparrow and veteran gatekeeper Hank Lundy. Sparrow soared to a decision win in their 10-round battle, which went a long way in living up to its pre-fight hype. Scorers of 96-92 and 95-93 for Sparrow overruled a dissenting 94-94 tally to give the lightweight the win in his first fight since last March after serving a suspension due to testing positive for marijuana. Dubbed the most significant local rivalry matchup since Frankie Mitchell’s 11th round knockout of Anthony Boyle in front of a sold-out Blue Horizon in June ’92, the demand for the fight prompted DAZN's social media team to air the previously-slated untelevised affair live on Twitter via Periscope. Sparrow and Lundy didn’t waste any time in going after one another. There wasn’t any feeling out process, with Sparrow looking to initiate the action early, but Lundy quickly adapting and putting in work to the body. Sparrow never strayed outside of punching range, leaving him wide open for a right hand to the chin and leaving him on wobbly legs. Lundy followed through with a left hook and subsequent flurry, but Sparrow wisely clinched his way out of trouble to ride out the storm. It reaped major dividends, as Sparrow put some serious separation between the two in a tide-turning 2nd round which ultimately provided the margin of victory. Lundy was a bit too ambitious in testing the mettle of his younger foe, eating a flush right hand down the middle which forced him to touch his glove to the canvas. A second knockdown later in the round put Lundy in a hole he wasn’t able to dig out of in the end. Sparrow continued to press the action the middle rounds, his modest knockout to win ratio not at all indicative of his punching power. Lundy struggled to maintain pace, only able to win later rounds when he was able to slow down the action. It was enough to close the widening gap on the scorecards, but never to the point of keeping Sparrow at bay. 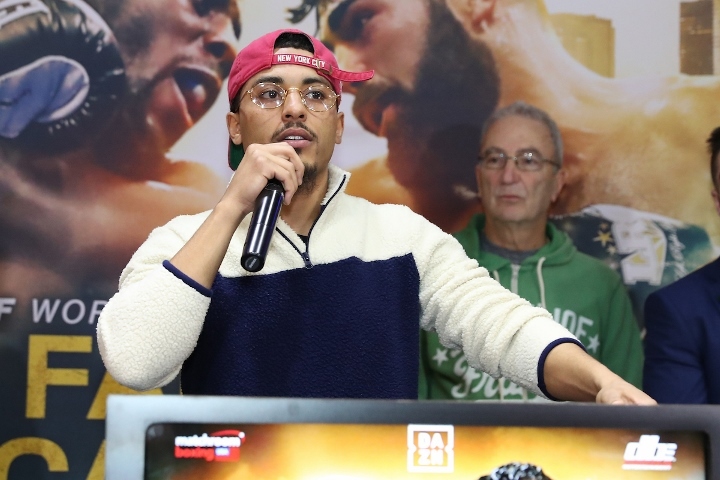 The 25-year old closed the fight strong, connecting with combinations upstairs while the 35-year old Lundy couldn’t offer any more than keeping pace with his local rival 10 years his junior. As a result, it’s the second straight loss for Lundy, who falls to 29-8-1 (14KOs). Sparrow improves to 10-1 (3KOs), figuring to remain far more active with a renewed clean bill of health and a career-best win to date.